Perhaps the two most influential books I read during my undergraduate course were a course book on quantum mechanics (I started off studying physics) and then later The Social Construction of Reality by Berger and Luckmann. Both books changed the way I thought about the world and my place in it. I was directed to The Social Construction of Reality by John Shotter, who was my tutor, and I was taken by the idea that we negotiate social meaning and social roles, and how over time these roles become institutionalised and become a social reality. Mind you I have never been back to the book. I’m a little nervous of going back. I recently watched the cult film Blade Runner after a gap 30 years during which time I remembered it as a film that had deeply affected the way I thought. Now I’m not sure why. Talking of Blade Runner brings me to the book it was based on. I point any of my tutees who can tolerate science fiction towards this book. The question at the heart of it is whether we will be able to create machines that are indistinguishable from human beings, and if this is possible then does it matter? In another of his stories he muses on the split-brain studies of Sperry and Gazzaniger and wonders whether you can create two identities in the same brain that are unaware of each other. What’s not to like? The title gives a good clue as what this is about. In some ways it is very dated having been published in 1974 while the American war on Vietnam was still in progress. In other ways the issues are still there for psychologists as they wrestle with their involvement in military work and interrogation techniques. I mustn’t complain, I also found some books on my shelf that clearly aren’t mine. Sorry about that. This is a wonderful book because it is very readable, has some great stories, some cutting-edge science and shows how research in neuroscience doesn’t need massive scanners but can be done with some cardboard and sticky-back plastic. The brief for the shelfie said you could choose a book by yourself! I’ve had the privilege to write with a number of co-authors to create textbooks for psychology students. I enjoy writing and I’ve found that each project has challenged and enhanced my understanding of the psychology I have written about. My choice, though, is none of these but a short story written with my nephew who was five at the time. It is one of a series in our attempts to write in the style of Mister Men books. Sometimes writing is more fun than reading. 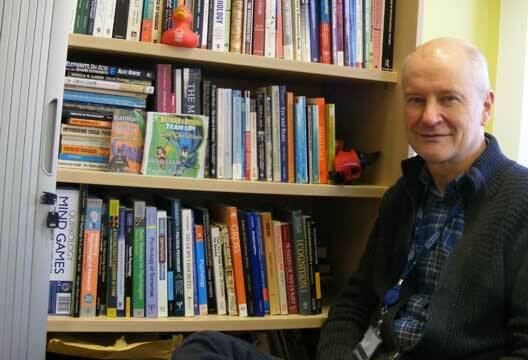 Phil Banyard has co-authored several psychology textbooks including Ethical Issues in Psychology (2001, Routledge), Introducing Psychological Research (2008, Palgrave Macmillan) and Understanding and Using Statistics in Psychology (2007, Sage).